When popes supplanted Rome’s emperors as sovereigns of the Roman world they borrowed much from their predecessors. Along with a lust for power and a propensity to wield it willfully the papacy arrogated to itself the title of “Pontifex Maximus”. Like the Caesars they perceived themselves as great bridge-builders. On reflection, the bridge, the Roman version being an extension of the versatile Roman arch, could be regarded as a powerful symbol of secular imperialism or evangelistic Catholicism: by bridge and aqueduct Romans in cuirasses or cassocks connected, conquered and colonized much of the known world. 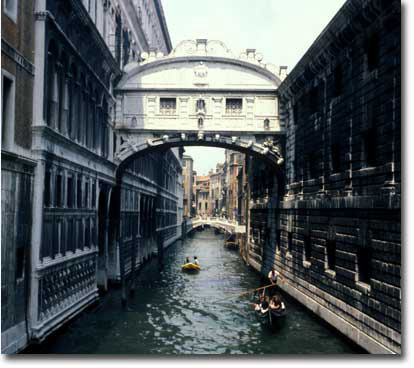 Since Roman times, bridges, still employing the Roman arch, or constructed by trestle and beam, or suspension, have become a prominent part not only of the functioning of cities, but also, in various times and places, have formed substantial parts of urban lore, history, art and iconography. Match the bridges with their cities.